Relaxing in a steaming bathtub at the end of a hard day is one of the best ways to unwind and de-stress. Add one of the many different bath salts – known for their therapeutic properties – and you could take your tub-time one step further. However, trying to find the best bath salts for your needs can become an overwhelming task. There are just so many to choose from. Epsom salt, Dead Sea salts, Pacific Ocean salts, and Japanese mineral salts, to name a few. Another detail you’ll want to think about is the various scents, essential oils and other fragrances that can be added. Do they have any benefits? Let us take the stress out of this whole task for you – here’s our guide to bath salts that’ll bring the spa experience right into your bathroom. Whether you are looking to de-stress, relieve aching joints and muscles or just simply indulge, there should be something to suit. Pure Organics is a Utah-based company dedicated to sourcing good quality natural ingredients. They promote natural and pure living combined with environmental and social responsibility. These bath salts are made from pure Epsom salt and, to keep it as natural as possible, it’s unscented too. The salt is 100 percent vegan, kosher, non-GMO and of pharmaceutical grade, making it one of the best organic bath salts. The ingredients in these salts include magnesium and sulfur. Magnesium improves sleep and concentration, soothes muscle cramps, reduces inflammation and relieves stress. Sulfur helps detoxify your body, eases headaches and migraines, plus aids in nutrient absorption. It dissolves quickly in water and you can even use it on your plants if you want to give them a pick-me-up. To alleviate sore muscles or relieve stress, simply add two cups of salt into running bath water and soak for 20 minutes. Alternately, add one cup to a foot bath, to soften and soothe your feet with a 10-minute soak. The company is so confident in its product that a 100 percent money back guarantee is offered if you are not satisfied with your purchase. One of the best organic bath salts available. Various sizes available, from 1 pound to 10 pounds. Might clump if you use it as a salt scrub. HIGHEST QUALITY, PURE UNSCENTED EPSOM SALT. RELIEVE SORE MUSCLES & TIRED FEET. Discovered during the Middle Ages in Epsom, England, water infused with magnesium sulfate has long been recognized for its soothing properties. 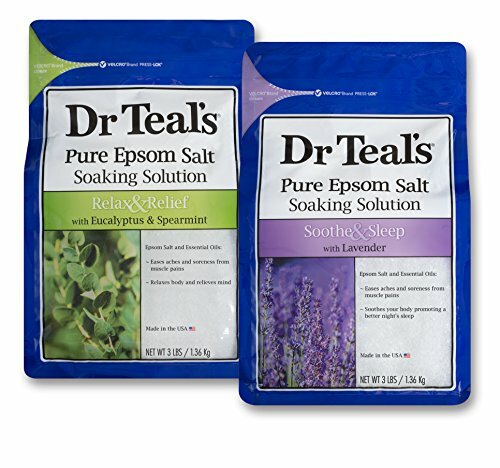 Dr. Teale uses Epsom salt combined with essential oils to create this twin-pack of bath salts. Each bag contains 3 pounds of product and has a resealable Velcro closure. One bag contains Epsom salt with lavender essential oils to relax your body, encourage sleep and reduce stress. The other includes Epsom salt infused with spearmint and eucalyptus essential oils. These help to ease aches and pains in muscles, and stimulate your senses. Using either one of these salts is quick and easy. To bathe, dissolve two cups of your chosen fragrance in a warm bath for a 20-minute soak. You could also dissolve a teaspoonful in a cup of hot water and rub it directly onto sore muscles. If you want to make your own exfoliating scrub, all you need is a handful of these salts mixed with your favorite shower gel. Choice of two different blends of Epsom salt and essential oils. A 3-pound bag of each. Essential oils used for fragrance. Some find the scents very strong. Made with Pure Epsom Salt (Magnesium Sulfate USP) and natural essential oils, Dr Teal's Epsom Salt Soaks provide an array of benefits. Resealable Bag: Our bags feature a VELCRO Brand enclosure to make resealing your epsom salts easier, quicker and sturdier than ever. Pregnancy is the time when some moms-to-be struggle with morning sickness, bloating and difficulty sleeping. These bath salts from Pink Stork aim to help relieve some of those issues. These salts are in flake form and sourced from the southern Dead Sea in Israel. They come in a 2-pound bag with a zip lock closure. 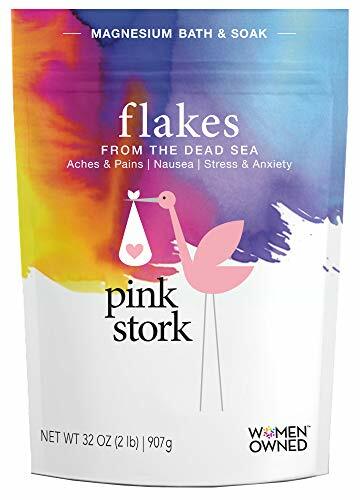 Pink Stork claims that the magnesium in these salts can help reduce the feelings of nausea and vomiting associated with pregnancy. The company also states it can support your energy levels, relieve aches and pains and promote sleep. Here is YouTuber Angela talking about Pink Stork Flakes as part of her list of First Trimester Must-Haves when she got pregnant a couple of years back. A soak in a warm tub infused with these bath salts can grant you some valuable time for yourself. The heat of the water will open pores, allowing your body to absorb the benefits of the salts. The founder and CEO of the company, Amy Upchurch, is a mom of five and wants to help others by producing natural organic products. The company has a happiness guarantee and asks that you get in touch if you are not completely satisfied with their product. They would like to be given the opportunity to put it right so you are happy. 100 percent Dead Sea salt. Non-GMO and completely allergen and gluten-free. Salts don’t seem to relieve nausea for many users. The San Francisco Salt Company has been making various salt products since 2002. These include gourmet sea salts for cooking and seasoning as well as a range of bath salts. This lavender-colored bath salt is made from Pacific Ocean sea salt with added essential oil. It also contains vitamin E, aloe vera and vegetable glycerin. The salts come in a 2-pound bag and are medium to fine grain. The calming effects of the premium lavender essential oil work to help you relax and unwind. This, in turn, can promote sleep and help you get a restful night. Lavender can also relieve aching muscles. For a relaxing bath, pour a handful into warm running water or use two handfuls for a therapeutic soak. These salts also work well as an exfoliating body scrub, by rubbing them directly onto wet skin in the shower. Or if you feel your feet need pampering, simply sprinkle the salts into a foot bath. Also available in a larger, 10-pound bag. Some find the fragrance smells medicinal or chemical-like. PREMIUM ESSENTIAL OIL: Naturally scented with the soft soothing scent of Lavender Essential Oil. RELAX AND UNWIND: Relaxes the mind and body to promote a restful night's sleep. Softens skin and soothes muscle aches and pains. Earth Corporation makes a number of different bath salts in Japan, which are imported and sold in the US. In contrast to many other bath salts that go for the floral fragrance approach, this forest-scented option has a more masculine scent of pine trees. These Japanese bath salts combine sodium with minerals, coloring and natural ingredients to promote your emotional and physical well-being. They also combine herbal essence for the dual purpose of relaxation and nourishing the skin. They can help soothe aches in the back or shoulders, and alleviate general fatigue. They also claim to increase the circulation of blood to the skin, giving you a feeling of warmth. The light fragrance is calming, but be warned, your bath water will turn bright emerald green. However, it doesn’t mean you’ll end up looking like the Hulk after your relaxing bath. Although green in color, it doesn’t stain the tub or your skin. All details on the container are written in Japanese. 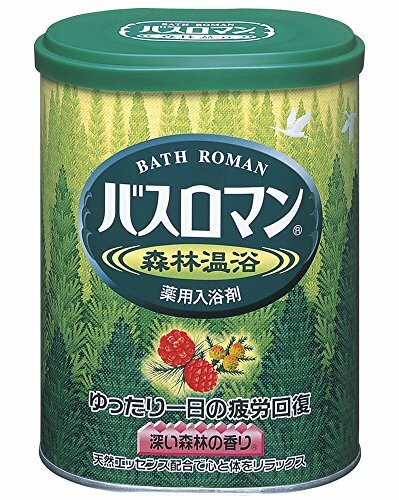 Bath Roman Bath Salt (Forest) [3 units] by Earth. If your muscles are in need of some TLC because you’ve been working out too hard at the gym, you might be asking yourself what are the best bath salts for sore muscles. This offering from the San Francisco Salt Company could fit the bill. 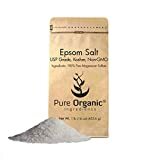 It comes in a large, 19-pound bag, containing pure unscented Epsom salt (magnesium sulfate) which is pharmaceutical grade and non-GMO. The medium grain dissolves easily and quickly in warm water. The magnesium within Epsoak could offer stress relief, boost your quality of sleep and improve your concentration levels. It can also improve the functions of your nerves and muscles. Sulfates can help remove toxins from the body, assist with the absorption of nutrients and enhance formation of joint proteins. Soaking in a warm bath with Epsom salt may even help raise the magnesium levels in your body. As well as soothe aching muscles it can assist with cleansing your pores and detoxifying the skin. 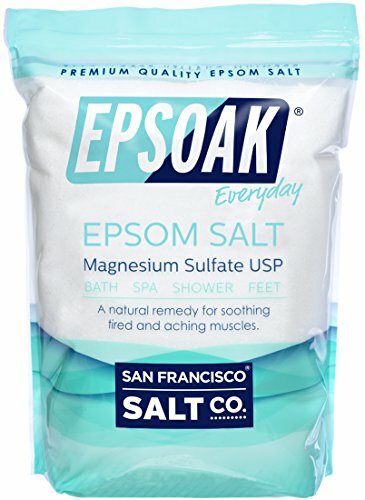 Non-GMO pharmaceutical grade Epsom salt. Medium grain to dissolve quickly. The best bath salts for sore muscles. Some find it difficult to reseal the bag after opening. 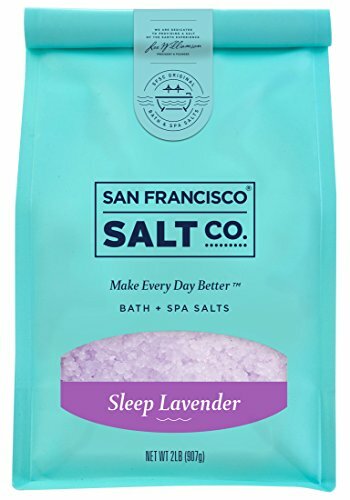 Bring the salts and minerals of the Dead Sea into your home with these bath salts from the San Francisco Salt Company. The therapeutic properties of this mineral and the salt-dense body of water in Israel have been acknowledged since biblical times. 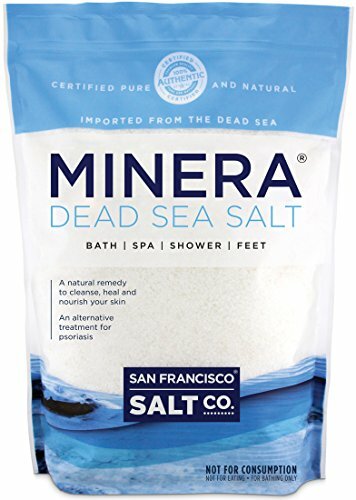 The all-natural 100 percent pure ingredients of Minera Dead Sea salt comes in a 5-pound bag. The salts are finely grained so they dissolve easily. These salts are certified as imported from the southern area of the Dead Sea. Its mineral-rich content is great for helping skin conditions such as psoriasis, and rheumatological complaints. Among other minerals, it contains potassium, magnesium, sulfur, and bromide. With it’s detoxifying and cleansing properties, it could also benefit other dermatological issues, like eczema and acne. To use as a relaxing muscle soak, add 1 pound of Minera salts to a warm bath, or put a handful in a foot bath to soothe your feet. It’s advisable if you intend to use it to treat psoriasis or another skin condition to chat with your doctor first to be on the safe side. 100 percent certified Dead Sea Salt. You need to use large quantities to obtain the benefits for skin conditions. Tree Hut has been making skincare products containing shea butter for over a decade. The company sources its natural ingredients from all over the world but makes the products in the USA. These bath salts contain Epsom salt plus 100 percent natural shea butter. They also contain vitamins A, E and F, and oils from safflower seed, evening primrose, sweet almond, orange, and macadamia seed. Shea butter is one of many plant oils that has an anti-inflammatory and antioxidant effect on the skin. It’s also a very effective moisturizer. The salts are available in 3-pound bags and with a choice of two fragrances: coconut lime, and tropical mango. Dissolve 1-2 cups in a bath of warm water to nourish, soften and soothe dry skin. They’re organic and free from parabens and formaldehyde donors. The fragrance is too intense for some. The bag does not reseal easily. COCONUT EXTRACT AND LIME EXTRACT - Quality moisturizers that softens and smooths skin with the ideal fragrance for the senses. Pretty in pink, this presentation jar contains 25 ounces of pomegranate and grapefruit scented bath salts. It comes with its own scoop for ease of measuring when adding to your bath. These bath salts are made from high-quality natural, non-toxic and organic products. Their nutrients can help keep your skin soft, smooth and supple and also cleanse and purify. Pour a scoopful into a running warm bath then lay back and relax while you soak. Use a small handful on wet skin for an exfoliation treatment or sprinkle some into a footbath to soften the skin on your feet. The pretty jar would make an appealing addition to any bathroom shelf or ideal as a gift for someone special. 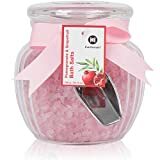 These pink bath salts are free from parabens, phthalates, and sulfates. Pretty display jar tied with a pink bow. Some customers don’t like the scent. SOOTHING BATH TREATMENT: Bath salt scrub will open pores and draw out pollutants, dirt and oils. BATH SOAK HEALING properties include nourishing the body, calming the mind, and restoring wellness. SALTS FOR RELAXATION: Pink bath bomb bath crystals fight stress, fatigue and lessen fine lines. The hot springs, or onsens, of Japan are renowned for their therapeutic and rejuvenating properties. 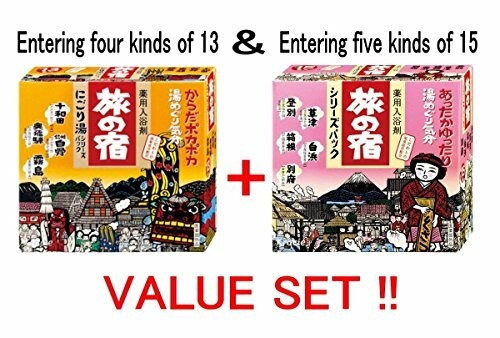 Now you can create your own onsen with this selection of mineral bath salts. This Tabino Yado Hot Springs selection has nine varieties of mineral salts. There are 28 individual foil sachets per box, each one containing 25 grams of mineral salts. Run yourself a nice hot bath, submerge your body and feel your muscles relax. The Japanese believe that an onsen treats the body, mind, and skin. The minerals help to promote circulation and warmth, and their strong aromas will give a relaxing experience. Good selection of different types of minerals. Might leave a white residue on the skin. Not a perfume or bubble bath - Minerals promote circulation and warmth... Intense aromas relax you and last as long as your bath! Bath salts have been used for many years for what is believed to be their therapeutic properties. They are generally made from Epsom salt which comprises of either magnesium sulfate or sea salt. Both of these types should dissolve easily in warm water. Anecdotally, these salts, when dissolved in a hot bath, may remedy many ailments including sore muscles, aches and pains, arthritis, skin conditions, and stress. However, scientific research to back up these claims is somewhat limited. Epsom salt is the “go-to” of choice when you feel the need to detox. Removing toxins from your body might help improve your health, treat constipation, assist with weight loss and relieve stress. It’s also thought that it may improve magnesium absorption. One study has shown that Epsom salt increased levels of magnesium within the body. To reap the benefits of this type of bath, dissolve two cups of Epsom salt in a warm bath by adding it under running water. Soak in the tub for up to 20 minutes. The addition of essential oils, such as lavender or peppermint, can help improve your mood and relax you. For those times when you pushed leg day too hard, or that CrossFit session was one step too far, bath salts might help. They can assist with recovery by soothing overworked muscles which have become tense, plus they help reduce inflammation. Again you will need about two cups dissolved in a warm bath, to soak your aches and pains away for around 20 minutes. Sea salt, or Epsom salts, can be used to help relieve the symptoms associated with certain skin conditions. These include psoriasis, eczema, and contact dermatitis. To help relieve dry, itchy skin, dissolve a cup of salts in a warm bath. Lay back and immerse yourself for about 20 minutes. Mineral salts such as those found in the Dead Sea in Israel could have positive health benefits for sufferers of rheumatoid arthritis. Try taking a hot bath, at about 95 degrees Fahrenheit, with Dead Sea Salts added, for 20 minutes on a daily basis. However, it’s advisable to check with your doctor before trying any alternative treatments. Using bath salts in the shower can help exfoliate your body and still impart some of the mineral benefits. Use a handful of salts to scrub all over yourself then rinse off. This is great if you don’t have a bathtub but still want to use therapeutic bath salts. On the days when you’ve spent a little too much time on your feet, use bath salts as a foot soak. Just half a cup of salt with some warm water, in a bowl, foot bath or basin, might help relieve swelling and soreness. You could even use some salts as a scrub after soaking, to remove calluses and dead skin. Health "BENEFITS OF EPSOM SALT BATH" !! Epsom salt is also useful in the garden, as plant food for vegetables, fruit, and flowers. Studies have indicated spraying magnesium-based fertilizer directly onto crops is an effective way to boost plant growth. So maybe after taking your bath, you could recycle the water on your lawns, tomatoes or roses. The benefits of bathing in salt date back many centuries and have been documented in numerous different cultures. Whether it’s dipping in the hot springs of Japan, or floating in the Dead Sea in Israel. Now we’re lucky enough to be able to indulge in this experience in our own homes. Many of these products that replicate such methods are organic and all-natural. 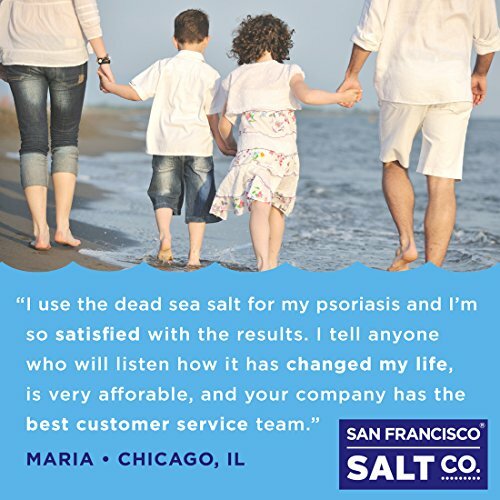 You can choose from Epsom salt, Dead Sea salts, Pacific Ocean salts, or Japanese mineral salts. Each has its own therapeutic properties to help you relax, heal and unwind. 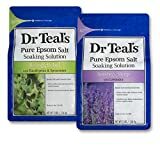 Taking into account the 10 best bath salts we’ve reviewed, our overall favorite would have to be Dr. Teal’s Epsom salt bath soaking solution. 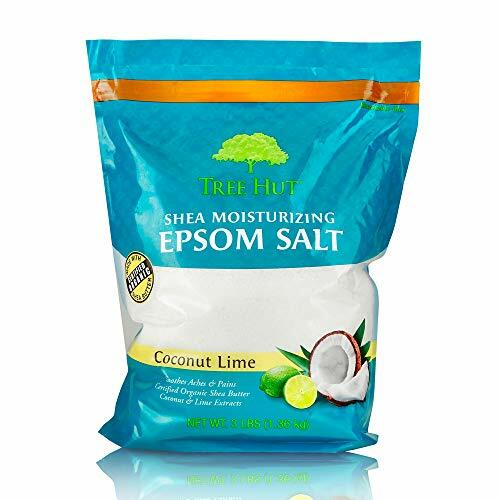 Made from pure Epsom salt, you have the option of added essential oils such as lavender or eucalyptus and spearmint. They can help both soothe aching muscles and joints, as well as promote relaxation and a sense of well-being. However, your preference could be down to your individual purpose. Perhaps you are looking for the best organic bath salts or the best bath salts for sore muscles. On the other hand, it may be that added fragrance or essential oils are important for you. Whatever your reason for using the best bath salts, we hope we’ve helped you narrow down the options. All you now need to do is run a hot bath, add your chosen salts—and relax.